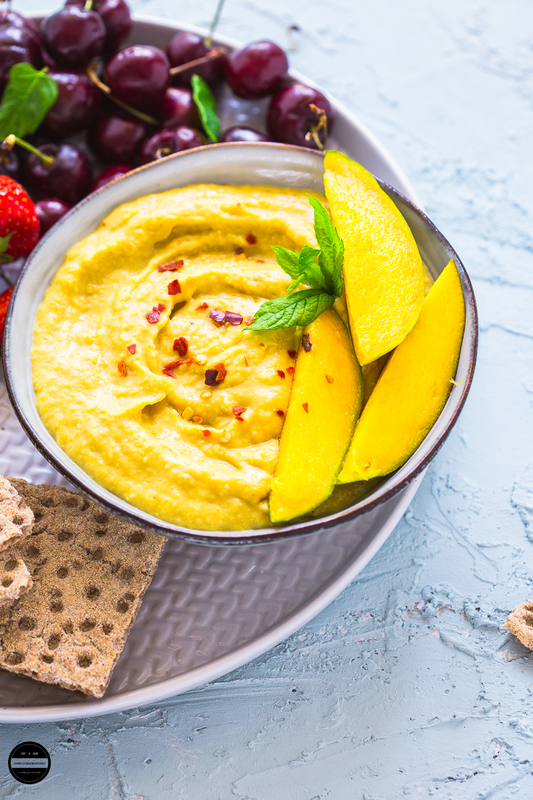 How to make Mango and Chilli Hummus | Mango and Chilli Hummus is a modern exotic twist to a traditional recipe of hummus. 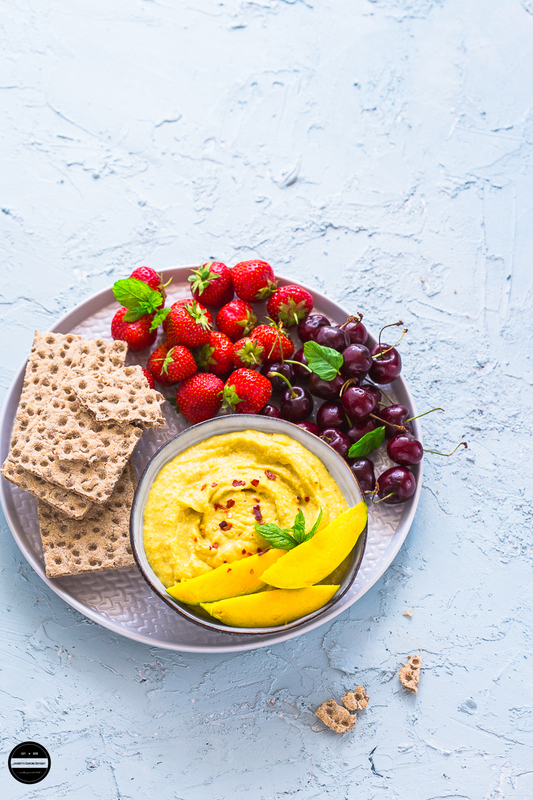 This delicious and vegan hummus dip is prepared with fresh mango and red chilli, and sure to please your taste buds if you like sweet but little spicy. This healthy and easy hummus recipe is sure for this summer which is prepared with real mango pieces and to add some fiery kick there is a fresh red chilli thrown in it too. 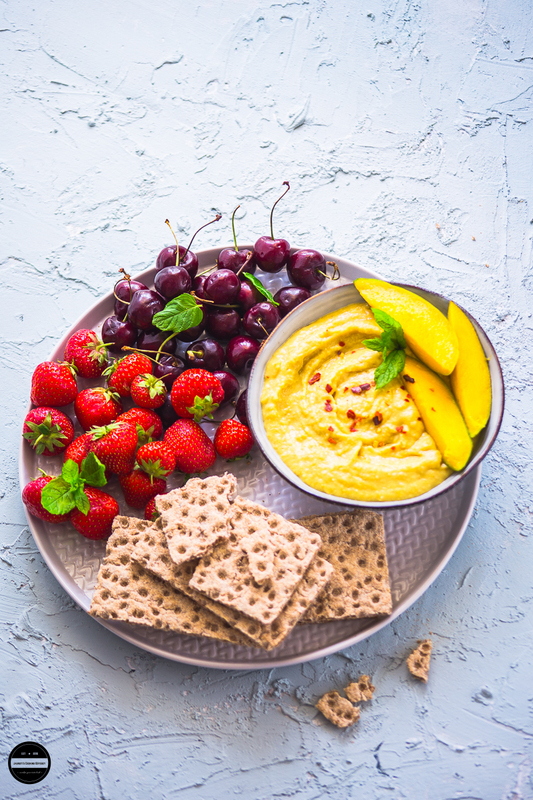 This fruity hummus can be eaten with fruit as a healthy snack or just indulge in with some tortilla crisps. We are a sport loving family and never miss the chance to enjoy a good match either on telly or sometimes going to watch it live in the stadium. We are currently enjoying the Football world cup 2018 in Russia. We are also looking forward to Cricket matches between India and England. It seems like the Indian team has brought the Indian summer with them! During these sporting events, we just want to be in front of the tv with snacks in hand! I first came across various flavours of houmous whilst I was wandering through the world famous Naschmarkt in Vienna, Austria. There were rows and rows of different houmous recipes that we were spoilt for choice! Since then, I have been meaning to recreate some of those recipes back home. Recently, there has been a surge of fruit and vegetables in the shops. Really good quality produces at much lower prices. One such fruit has been mangoes. It's rare that you get such sweet mangoes available in UK supermarkets! So naturally, I bought more than I could eat! I had planned to make a houmous dip any for the sports anyway, so thought it would be a good idea to try out mango houmous instead! Normally, I like to stick to traditional recipes, but when you've eaten a lot of the traditional recipe, it feels good to venture out a bit more. Plain houmous has become a staple in our household so a little change up here and there is exciting. I have used fresh mango pieces but you can use mango puree if you can't find fresh mango. 250 g boiled and drained chickpeas. Place all the ingredients into the Optimum Vac2 blender and blend until you get a nice smooth paste. Transfer to a bowl and garnish it with mango slices, fresh mint or coriander leaves. If after reading this post you fancy owning your own Optimum Vac 2, you can buy it from this link here. This is an affiliate link, and if you buy through this link then I may get a commission on your purchase at no extra cost to you. Simply add 5457 ambassador code in the comment box when purchasing or mention the code if ordering over the phone. This way, they know you have ordered through JCookingOdyssey. Additionally, add AMB20 in the promo code box, you will get £20 off your purchase. The Mango and chili hummus sounds so flavorful Jagruti and your pics literally make me drool !! Awesome photography ! Thank you Poonam. Make it if you get chance. Drooling here! Now I will want to buy any mango just to make this hummus. Looks so yummy. Vegan hummus recipe is tempting..Would buy some mangoes for this now. Thanks Parul, bring it before they disappear from the market. What a lovely idea for another mango dish! Mangoes with chilli is one of my favorite flavors..need to try this soon; we are all hummus lovers at home :D Lovely clicks dear! Thanks Vanitha, we too hummus lover here :) Hope you guys like this flavour too! A twist to hummus, excellent. It must have tasted good. This is such incredible looking mango chilli hummus. I love hummus and always try new variations, will try your version too. Love the textured broad and the beautiful photography. Thanks Sapana, please do and let us know how you like it. Now I would love to call you as hummus queen, never thought of so many flavifla and that too with coconut oil. Tempting bowl of hummus. I wish I could dip some pita chips into that luscious, creamy, delicious looking hummus. What a refreshing flavor. Vegan hummus are superb idea always. And as always the clicks are wow :) Love the use of mango here !!! wow mango in hummus sounds interesting. But hummus are a great side dish with fruits of salad sticks. Loved it. Just love the colour of this and the concept too. Mango hummus has me completely intrigued.